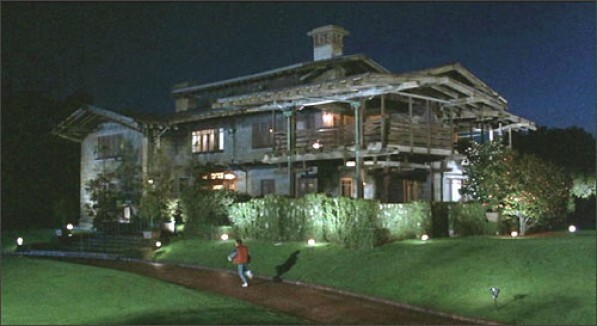 This notable house is famous for it’s appearence in the movie “Back to the Future” where it was depicted as the home of “Doc” Brown. The home is considered to be an excellent example of the American Arts & Crafts movement in architecture. It was designed by Greene & Greene for David and Mary Gamble of Proctor & Gamble, and it was built in 1908. The house is registered as a National Historic Landmark. It’s owned by the City of Pasedena, and operated by the University of Southern California. The house was included in a list of all-time top 10 houses in Los Angeles in a Los Angeles Times survey of experts in December 2008. It is available for tours. The arts & crafts style was a movement away from the heavy ornamentaion of the Vicorian era, and was inspired by examples of Japanese architecture which focuses on the innate beauty of stone, wood, glass and nature. The arts & crafts movement was pivotal in ushering in ideas that would become the basis of modernism in American architecture. This entry was posted on Wednesday, November 17th, 2010 at 2:43 pm	and is filed under architecture & design, notable homes. You can follow any responses to this entry through the RSS 2.0 feed.